One of the first signs that bed bugs may be present are bed bug bites on your body. 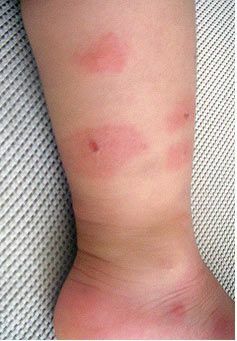 Small red bumps in a line may indicate bed bug bites, but could also be a skin reaction or a bite from another insect, such as a mosquito, ant, or spider. Without a visual confirmation of bed bugs, it can be very difficult to determine the origin of a bite. Bed bug bites are round and red, often with a slight bump as part of the body’s reaction. They tend to itch and burn, though reactions are different depending on the person — while some react very severely to bites, others may not notice them at all. Bed bugs most commonly bite the arms, underarms, and shoulders. The bites often appear in lines or clusters, not individual marks. This is because bed bugs feed in short intervals, typically 3-4 times spaced out in increments of about half an inch. If you think you may have bed bug bites on your body, we suggest monitoring for bed bugs by applying Climbup Insect Interceptors. Place the traps under the feet of your bed or other furniture, and the bugs will fall into them and get trapped.